The Port Authority Ladies Cascade Waterproof Jacket Style L322 is available in Ladies Sizes: XS-4XL and can be purchased in your choice of the following colors:Black/Magnet Grey, Charge Green/Magnet Grey and Imperial Blue/Black. The Cascade Waterproof Jacket is great for those days when the rain and wet will not let up. Works great in layers. It has fully sealed seams and waterproof zippers. 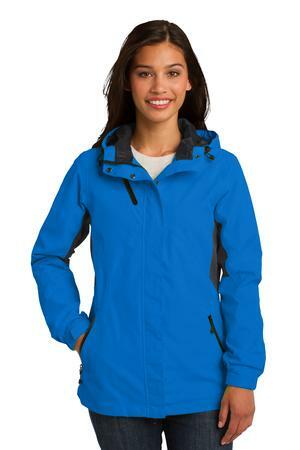 The Port Authority Ladies Cascade Waterproof Jacket Style L322 is available in Ladies Sizes: XS-4XL and comes the following colors: Black/Magnet Grey, Charge Green/Magnet Grey and Imperial Blue/Black. Be the first to review “Port Authority Ladies Cascade Waterproof Jacket Style L322” Click here to cancel reply.